At a time when Donald Trump is involved in countless scandals and has even gone as far to suggest building a wall between the US and Mexico, DESIERTO, is a timely and thrilling survival film exploring the side of human nature many shy away from. 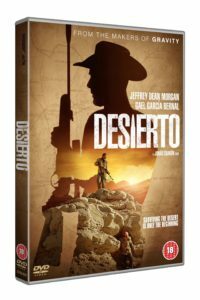 DESIERTO, arrives on DVD, EST and VOD on the 7th of November, just one day before the results of the US election and we are giving you the chance to win a DVD copy! Directed by Gravity writer, Jonas Cuaron, DESIERTO features a fantastic cast led by the BAFTA nominated, Gael García Bernal (The Motorcycle Diaries, Y Tu Mamá También) and The Walking Dead’s Jeffrey Dean. The film follows Moises (Gael García Bernal) as he and a small group of immigrants attempt to travel across the Mexico border on foot, seeking a new and better life in the US. They are discovered by a lone American vigilante, Sam (Jeffrey Dean Morgan), and a frantic chase begins. Set against a stunningly brutal landscape, Moises and Sam engage in a lethal match of wits, each desperate to survive and escape the desert that threatens to consume them. © 2016 Altitude. Entertainment Inc. All rights reserved. The competition ends at 23:59 on 17 November 2016. The prize consists of a Desierto DVD.